I love pesto-it’s just so versatile. It can be drizzled over pasta, on sandwiches, or almost anything that comes off the grill. This is a recipe that uses chicken broth in place of some of the oil. The result is a flavorful pesto with many fewer calories. This also gives it a slightly thinner consistency which makes it easy to drizzle. I made this tonight with some basil from our container herb garden. It got mixed reviews from the Tiny Tasters. With time and repeat exposures this is a flavor profile the kids may get used to. I would definitely go easy on the garlic at first until your little ones get used to it. The raw garlic can be a bit “spicy” for kids. 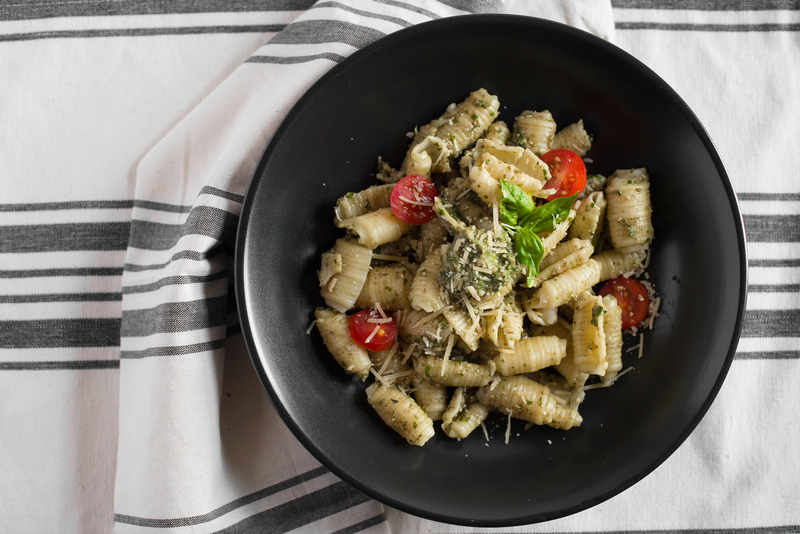 If they are trying pesto for the first time, you may offer a few bites of pasta with the pesto to try. If they don’t love it, have their favorite sauce as a back up and try again in a few weeks. Remember, with repeat exposures a “Yuck” can become a “Yum”!!! This is a flavorful smooth pesto that can add punch to an of your baby's meals. Go easy on the garlic at first, as it may be strong for your baby. This is a nice way to add nutritious greens to your baby's finger foods like pasta. Talk to your doctor if there is a concern about food allergies in the family, as this recipe does contain tree nuts.